it's a natural horse care product too!" How is apple cider vinegar used for horse care you ask? The nutritional bounty found in unpasteurized apple cider vinegar (ACV) is not only good for people, it's wholly beneficial for horses as well. It's a nutritional supplement added to both feed and water. It helps prevent intestinal stones called enteroliths. It's a natural horse fly spray. Do you use apple cider vinegar to care for your horse? Click here to share your vinegar horse care experiences and invite comments from other readers of this web site! Dr Jarvis, the Vermont country doctor who popularized the use of apple cider vinegar in his book Folk Medicine, found that a horse would chew the wood of his stall because the wood contained potassium. Experimenting with calves, he found that they would not chew the wood of their pens if ACV was added to their drinking water, since apple cider vinegar is an excellent source of easily absorbable potassium and other trace minerals. Besides the nutritional benefits , vinegar helps to purify the drinking water by destroying harmful microorganisms that can thrive in neutral or mildly basic water. For horses, recommended dosage rates vary from 1 cup (250 ml) of ACV for every 50 gallons (190 liters) of drinking water all the way up to 1 cup (250ml) for every 6 gallons (23 liters). A tip commonly used - for horses that will not drink the water in a new location: add some apple cider vinegar to the unfamiliar water! For a healthy horse, use 1/4 cup (60 ml) of unpasteurized ACV on his feed grain per day. Dilute the vinegar 50/50 with water before adding to the feed. Because of it's potassium and associated trace mineral content, this feed supplement is invaluable for mares coming up to foaling and it is also beneficial for older horses with digestive difficulties or arthritis. Intestinal stones called enteroliths, can develop in susceptible horses which can cause blockages that require expensive surgery. Since the ingestion of vinegar increases the intestinal acidity in horses, it helps prevent these stones from forming according to veterinary researchers at the University of California at Davis. The number of horses developing enteroliths has increased over the last 10 years especially in certain geographical areas such as the southwestern part of the United States, particularly California. As well, certain breeds such as Arabians and Morgans seem to be more prone to enteroliths than others. For more horse care information and recommended preventative measures related to the horses diet and management, just click here. 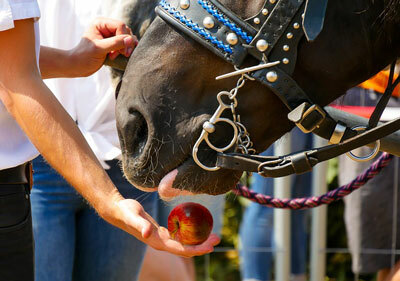 Another benefit of feeding your horse apple cider vinegar is to make the horse less attractive to flies and insects. Some specialists believe that horses sweat the vinegar out so that it becomes a natural horse fly spray. Insect bites not only cause your horse itchy discomfort, they can be areas where skin bacterial and fungal infections can occur. As well, some types of hives are commonly caused by insect stings or bites. They can cause other health risks by spreading such diseases as West Nile virus, encephalomyelitis viruses and equine infectious anemia. Never use a commercial fly repellant containing DEET on horses (or other animals) since it can be absorbed or ingested by them and cause unwanted toxic side effects. Mix all ingredients well and store in a handy spray bottle. Dissolve the sugar in the vinegar solution then place in a large jar and punch holes in the lid. The flies will get in but won't be able to fly out. For even more protection against insects and flies, try to identify the type of insect or fly bothering your horse because they all have their own preferred breeding spots and feeding times as shown in the table below, then use the appropriate horse care tips for natural fly protection listed below the table. Eliminate insect breeding sites as much as possible. Cover manure piles and dispose of them often. Eliminate standing water that can collect in such places as cans, old tires, discarded bedding and wet organic material. Stable horses at sunrise and sunset which are peak feeding times for black flies, no-see-ums and mosquitoes. Install overhead stall fans to interfere with the insects flight. Use fly masks, bonnets, body sheets and other clothing that does not allow the flies to reach the skin. Let your horse's mane and tail grow so that he will have extra swishing power. Keep horses away from standing water. If you don't mind having Muscovy ducks around the barn, they will remove adult house flies more than 30 times faster than the most efficient commercial devices. 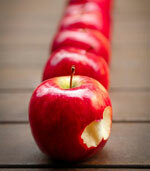 Full strength apple cider vinegar can be rubbed directly into the horse's skin around a ringworm infection. Ringworm is an infection of the skin and hair by several types of fungi (not worms). Rub in thoroughly two or three times a day for several consecutive days. This is especially useful for ringworm infections that are too close to the eyes to use a copper wash.
Thrush and other foot fungus infections can be greatly reduced by a regular spray or soak application of apple cider vinegar to the sole and frog of your horse's feet. By making the hoof area more acidic, fungus is no longer able to grow well there. A general horse hoof soaking solution can be prepared by adding 1/4 cup (60 ml) of apple cider vinegar to one gallon (3.8 liters) of water. The vinegar application will, at the same time, speed up the healing of any other foot infections or bruises your horse might have. An interesting article on horse hoof abscesses that stresses the beneficial role apple cider vinegar can play in their treatment can be found here. 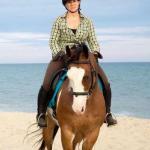 This is the place to share your stories on using apple cider vinegar to care for your horse. Allergies in horses and using ACV- any positive results?? ACV for pony with lumpy neck?